Visible by kayak from the Huleia River, or from a roadside overlook, the otherwise closed-to-the-public Huleia National Wildlife Refuge in southeastern Kauai is a popular bird watching spot. The site is one of just two sanctuaries on the planet (both National Wildlife Refuges on Kauai) home to wild populations of five species of endangered Hawaiian waterbirds—the Hawaiian coot, stilt, duck, goose (the state bird) and the elusive moorhen. Twenty-six other species of bird also call the federally-managed wetlands home. The lush landscape of riverine pools and waterfalls that surround the refuge have served as a jungle backdrop in several movies including Raiders of the Lost Ark, Jurassic Park and Lost World. The refuge’s flat valley, formerly comprised of wetland taro and rice paddies, is shielded from the sea to the west by a long ridge of peaks. 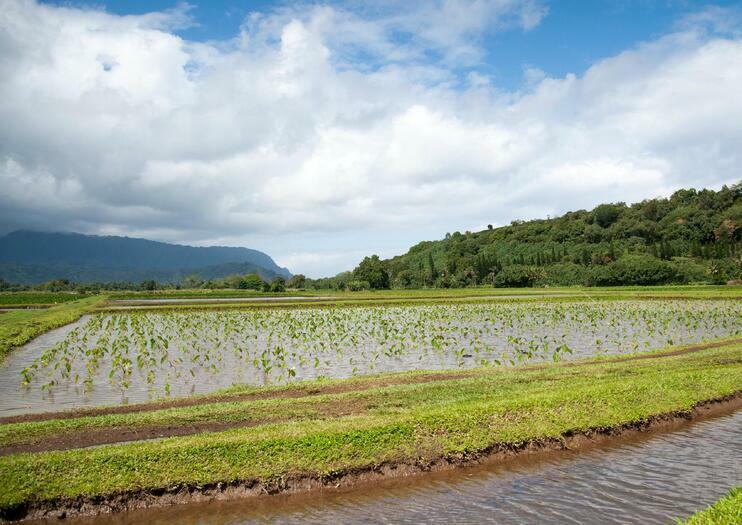 It abuts Alekoko, the Menehune Fishpond, a historic aquaculture system thought to be built 1,000 years ago by an early and mythical race of Hawaiian of people called the Menehune. The refuge is four miles southwest of Lihue via Highway 50W. The best way to view the refuge is on a guided kayak tour, but if you’re short on time, it’s also visible from the Alekoko Scenic Overlook off Hulemalu Road, just under a mile from the Nawiliwili Small Boat Harbor.